NEW: Bush says Wyeth's work "captured America"
(CNN) -- Andrew Wyeth, the American painter perhaps best known for his painting of a young woman in a field, "Christina's World," has died, according to an official with the Brandywine River Museum in Pennsylvania. 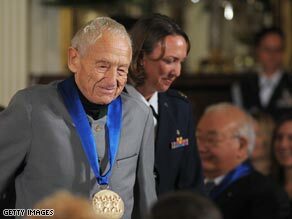 Andrew Wyeth received the National Medal of Arts from President Bush in November 2007. Wyeth, 91, died in his sleep Thursday night at his home near Philadelphia, Pennsylvania, according to Lora Englehart, public relations coordinator for the museum. The acclaimed artist painted landscapes and figure subjects and worked mostly in tempera and watercolor. He was widely celebrated inside and outside of the art world. Wyeth received the Presidential Medal of Freedom in 1963, and President Nixon sponsored an exhibition of Wyeth's paintings at the White House. In 2007, President Bush awarded Wyeth the National Medal of Arts in recognition of his lifetime achievement and contribution to American arts and culture. Two years earlier, Wyeth and his wife, Betsy, presented to the White House his painting "Jupiter," which is displayed in the residence's family sitting room. Bush issued a statement Friday saying that he and first lady Laura Bush "deeply mourn" the death of Wyatt. "Mr. Wyeth captured America in his paintings of his native Pennsylvania and Maine," Bush said. "On behalf of the American people, Laura and I offer our sincere condolences to Betsy and the Wyeth family." Wyeth, who lived in Chadds Ford, Pennsylvania, and Maine, "has been enormously popular and critically acclaimed since his first one-man show in 1937," according to a biography in InfoPlease. His main subjects were the places and people of Chadds Ford and Cushing, Maine. "Christina's World," painted in 1948, shows a disabled Maine neighbor who drags herself through a field toward her house in the distance. The painting, displayed at the Museum of Modern Art in New York, has been regarded as Wyeth's most popular. "His 'Helga' pictures, a large group of intimate portraits of a neighbor, painted over many years, were first shown publicly in 1986," the InfoPlease biography says. Those were painted in Pennsylvania. Wyeth, the youngest child of painter N.C. Wyeth, formally studied art with his father as a teen, "drawing in charcoal and painting in oils, the media of choice for N.C. Wyeth. It was during the family's annual summer vacations in Port Clyde, Maine, that Andrew was able to experiment with other media to find his own artistic voice," according to a biography in the Farnsworth Art Museum in Maine.